REGISTER EARLY – these workshops fill up in a few days. 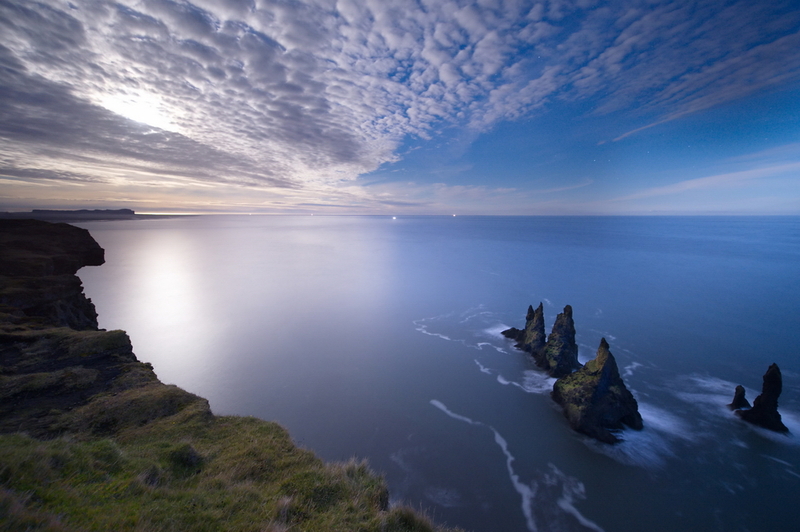 Iceland – The Land of Fire and Ice – is an experience for non-photographers and photographers alike. 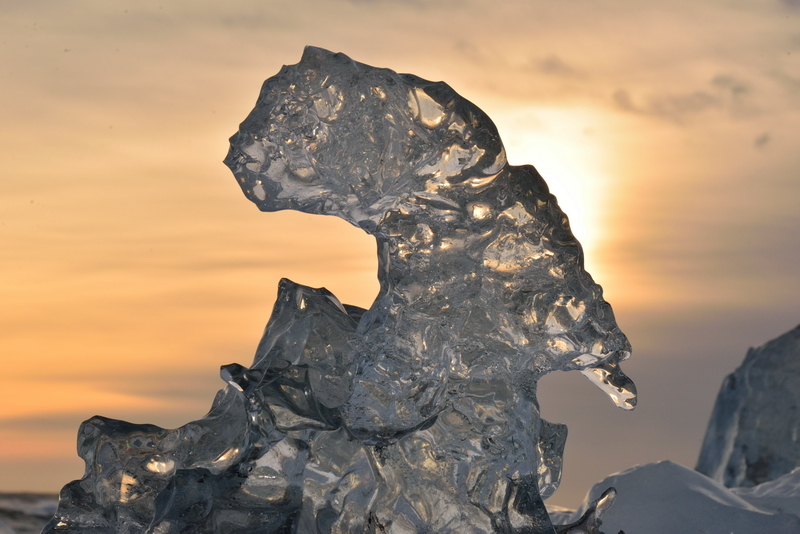 The country provides the opportunities to capture mighty glaciers, waterfalls and spouting geysers. Majestic mountains, magnificent coastlines and smoking volcanoes. September is the beginning of the awe-inspiring Aurora Borealis – the Northern Lights. Iceland is by far the most ideal destination for viewing the Aurora Borealis. Its modern infrastructure and excellent location, midway between Europe and the United States and with direct flights makes it ideal for sighting of the Northern Lights. In late summer Iceland is truly magical. As this workshop is scheduled for September and solar activity permitting we should have some opportunities for seeing and photographing the Aurora Borealis. Deborah Sandidge is a professional photographer specializing in travel and freelance work. She is the author of Digital Infrared Photography, published by Wiley. Deborah teaches online courses including Long Exposure Creativity, Infrared Photography, and Artistic Imagery. You can’t get a better instructor for Long exposure, IR and creative photography than Deborah. Shiv Verma is a professional photographer and educator. Chairman of the Photographic Society of America’s International Exhibition, Vice President of the New England Camera Club Council and a member of multiple photographic associations. He conducts photo workshops worldwide. REGISTER EARLY AS WE FILL UP VERY FAST. This week I saw a post on Facebook where a friend was talking about seriously starting to use Back Button Focusing. I know there are lots of opinions and articles on this topic but one more will not hurt. Please note, this has nothing to do with back focusing. Before we go to far into the BBF stuff let’s get familiar with camera focusing. Most modern DSLR Cameras have the ability to manually focus on your subject or automatically focus. Some lenses do limit you to manual focusing as they have no motors and electronics to drive the focusing elements. Automatic or Auto Focus has a few modes, One Shot, AI Focus and AI Servo in Canon speak and AF-S and AF-C in Nikon speak. There really should be some ISO standards for this kind of stuff. One Shot and AF-S basically means the camera will trigger the lens to auto focus on the subject, lock the focus for you to capture the image. AI- Servo and AF-C means the camera will trigger the lens to auto focus on the subject and then do its best to keep the focus on the subject while the subject is in motion. Canon has AI-Focus which is supposed to intelligently detect motion and trigger the appropriate auto focus mode, one shot of AI-Servo. This can be problematic so let’s leave it out of this article. No lets understand how we get this to work. By default your camera is set to focus and read the exposure when you half press the shutter button. Fully depressing the shutter button takes the picture. Not a bad way to do your photography. So what is the problem? If you have a static subject, and use center auto focusing point (it is the most sensitive AF sensor) you would half depress the shutter button. This action will initiate the auto-focus and then you will see or hear focus confirmation, now you can depress the shutter all the way and capture your image. Optionally, keeping the shutter button half depressed you can recompose and then press the shutter button all the way and take your image. This system works great for static subjects. Now you are trying to photograph moving subjects. You can’t half depress the shutter and lock focus and then take the shot because your subject will have moved and no longer in focus. You switch your camera to AI-Servo (canon) or AF-C (Nikon). You are capturing great action images and you notice a great subject that is static. You point your camera, focus and recompose – Oh! NO! you lost focus and more Oh! No! the opportunity is gone. What could you have done? You could have switched the camera back to One-Shot or AF-S or switched your lens to manual focus after getting focus and then pressing the shutter to grab the shot. This would definitely be too late. To overcome this issue you need to separate the focus initiation from your shutter release. Now you need to assign focusing to some other button. Typically this is one of the buttons on the back of your camera and hence the term Back Button Focusing or BBF. 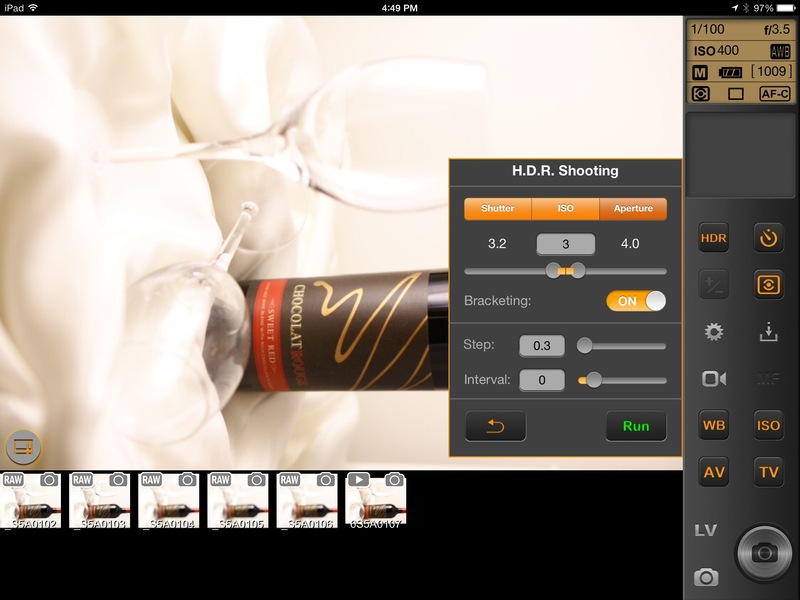 Using your custom functions or menu functions set your shutter to meter only, assign the AF-On button to initiate focus. Now you will use your thumb to depress the AF-On button to initiate focus and then use the shutter button to capture the image. There are two steps but well worth it. One of the greatest benefits is when you want to lock focus, you simply release the AF-On button. The lens will not refocus till you depress the AF-On button again. So for any action photography you can be ready for any motion and yet be in a position to lock focus when you need to. A huge benefit, you can leave your camera in AI-Servo or AF-C mode and never have to switch to One Shot or AI-S mode. When you use BBF, as long as the AF-on button is depressed the focusing system will remain active in follow focus mode tracking your subject (AI-Servo or AF-C), release the button and focus stays locked. So for stationary subjects, all you need to do is to tap the AF-ON button and focus system will focus and lock. Remember to release the AF-On or the camera will continue to try and refocus. Now once you set BBF you need to be aware that this will take some getting used to. Your fingers and brain need a major reset. You will miss a few good shots but once you are used to this system you will wonder why you have been wasting so may good opportunities. Warning for Nikon users: The back button focusing button AF-ON will not trigger the lens vibration reduction “VR”. The shutter button must be half depressed to trigger VR. If poetry comes not as naturally as leaves to a tree it had better not come at all. 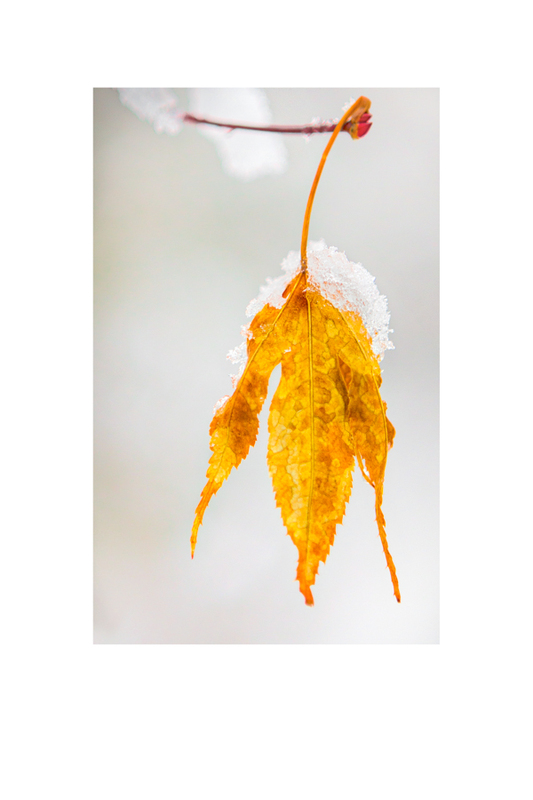 Even a maple leaf past seems to feel this New England cold. Google updates the NiK Plug-in suite. Google has released Version 1.110 of the NiK Plug-in suite. Updates are installed automatically so you don’t have to do anything. On a personal note, I wish they would upgrade Define and Sharpener Pro – the software is so outdated. Color Efex Pro 4: Fixed the functionality of the Cool Ice method in Photo Stylizer. 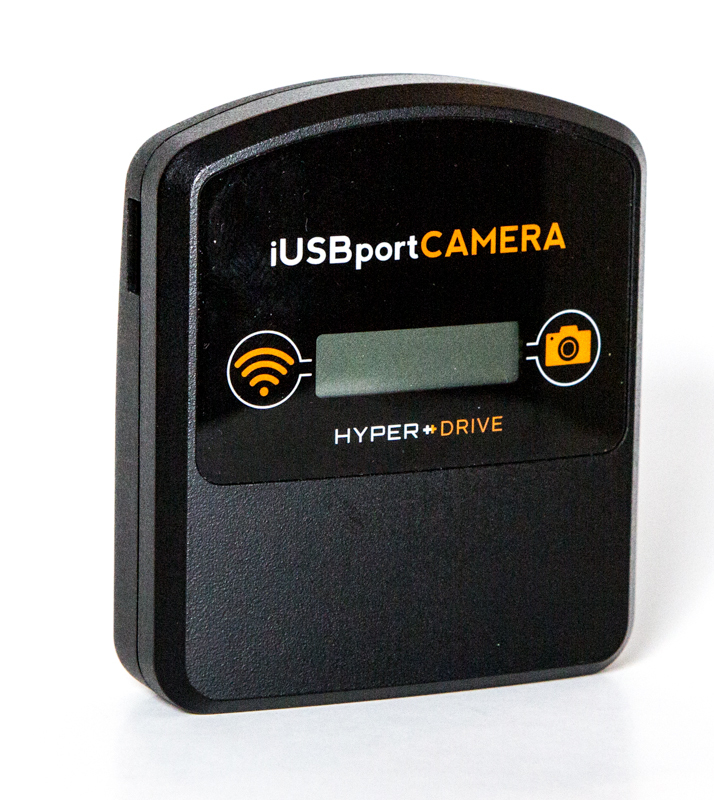 The iUSBPort Camera is a wireless camera to iPad tethering device compatible with a number of Canon and Nikon DSLR’s. It communicates with the camera via a USB cable and communicates with the iPad in WiFi 802.11b/g/n “Access Point”, “Ad Hoc” and “Infrastructure” modes. 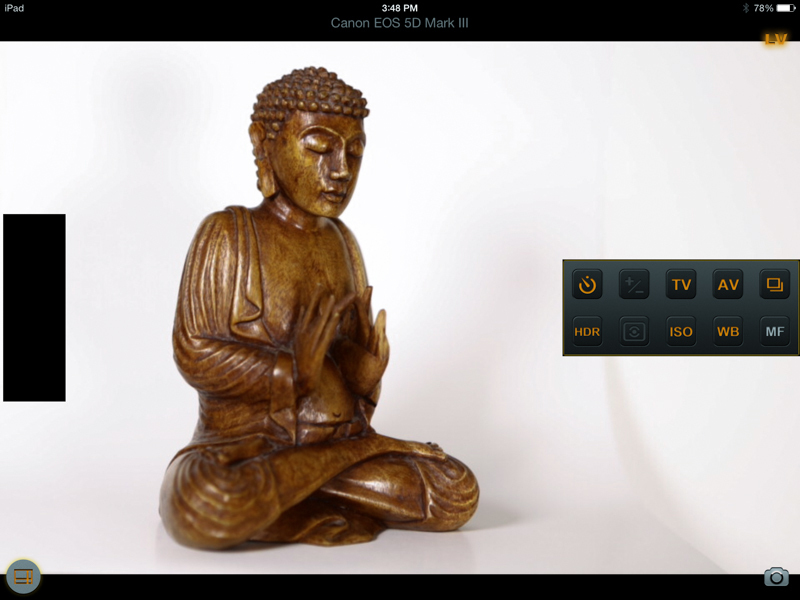 It allows your iOS devices, MAC’s and PC’s to remotely control your camera. Of significance is the ability to expand the size of your LCD view into the size of your IOS or personal computer screen. The iUSBPort Camera is manufactured by Sanho Corporation the makers of IUSB Port, HyperJuice and HyperDrive devices. The remote control software is a free app available from Apple iTunes Apps store for iOS devices and from Sanho for Android devices. As of the writing of this review I found the most control and operation flexibility is offered when using an iPad. Input Power: 10W (5V, 2A) via standard micro USB port. 5-7 hours to full charge. The iUSBport Camera package includes a standard mini USB cable and a USB recharging cable. You will need to charge the battery that is internal to the unit and rated at 3300 mA hours. The battery can be charged using any USB port on your PC or an external USB charger. A fully discharged battery requires about 7 hours of charging time and gives you a useful charge of approximately 8 hours. This is as stated by the manufacturer but not tested for this length of time during this review. I do find that this duration for recharging may pose a problem. A battery compartment would be a nice feature allowing you to replace the discharged battery and continue shooting. 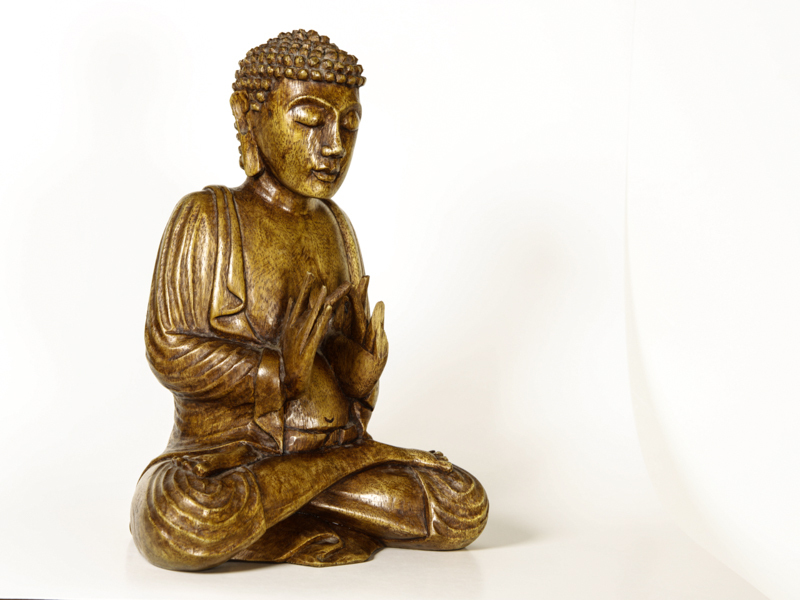 The device itself is made of plastic and is relatively large. The underside of the unit has a standard cold shoe mount enabling you to mount the unit into your camera’s hot shoe flash mount. This mount also has a quarter inch socket allowing you to use the unit with any alternative method of threaded mounting. The mini USB cable connects to the USB port on your camera. Turning on the unit with the power button on the side opens the display on top of the unit. This is a two-line display that provides various status messages. An additional blue light indicates power on and flashes during data transfer activity. A battery charge indicator stays a yellow/orange during charging and turns green when the battery is fully charged. If you have the older app please delete it and install the latest app. There are significant enhancements and additional features that have been incorporated. Once you have downloaded the application from the app store you will need to pair your iOS device with the iUSBport Camera. There are multiple ways to pair and connect the devices using either an ad-hock network or your existing Wi-Fi network. If you use the ad-hoc network your iOS device will not communicate with the Internet. Pairing using your existing Wi-Fi network will allow your iOS device full access to the Internet while connected. Either of these options works well and both operate at about the same network speed. However, the advantage of an ad-hock network is that you can use the paired configuration in any location. This is clearly a convenient feature and will be appreciated by most photographers. Now go to “settings” on your iPad and you should see iUSBport as one of the network choices. Select it and wait until the connection is established. 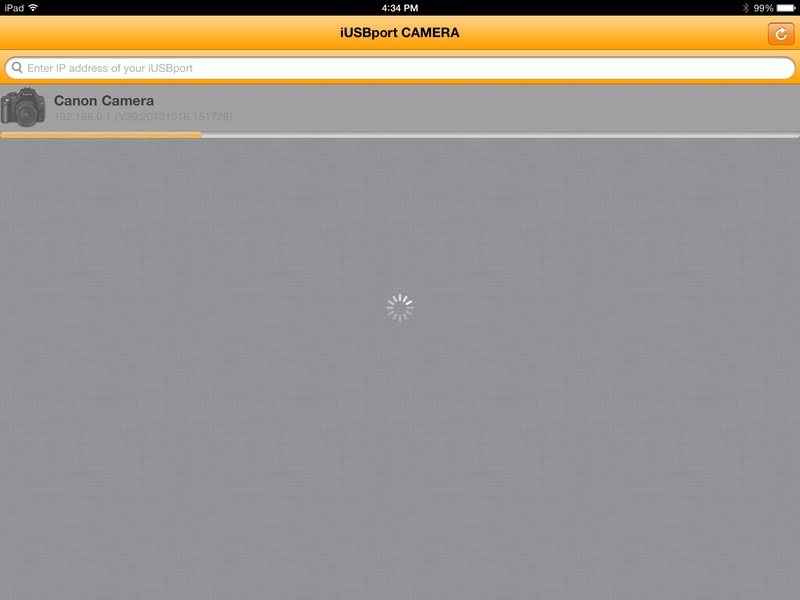 Now open the iUSBport application and if you do not see your camera on the Dashboard tap the refresh icon (top right). On a successful detection of the camera the iUSBport Camera will display “iUSBport Camera Tethered”. Concurrently the Camera Control Panel will be launched. The top right of the screen displays all the camera settings that the camera has been set with. 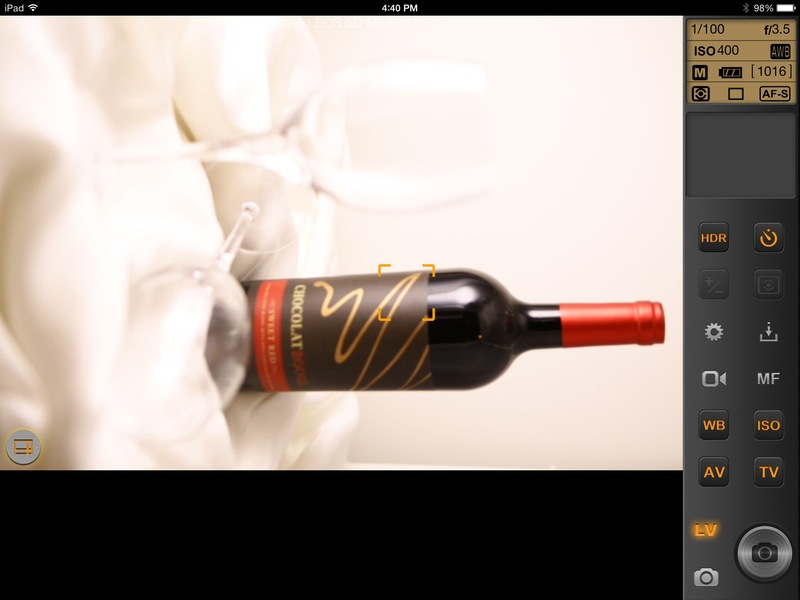 Tap Lv and the camera will switch to Live View mode and the image preview will be displayed on your iOS device. 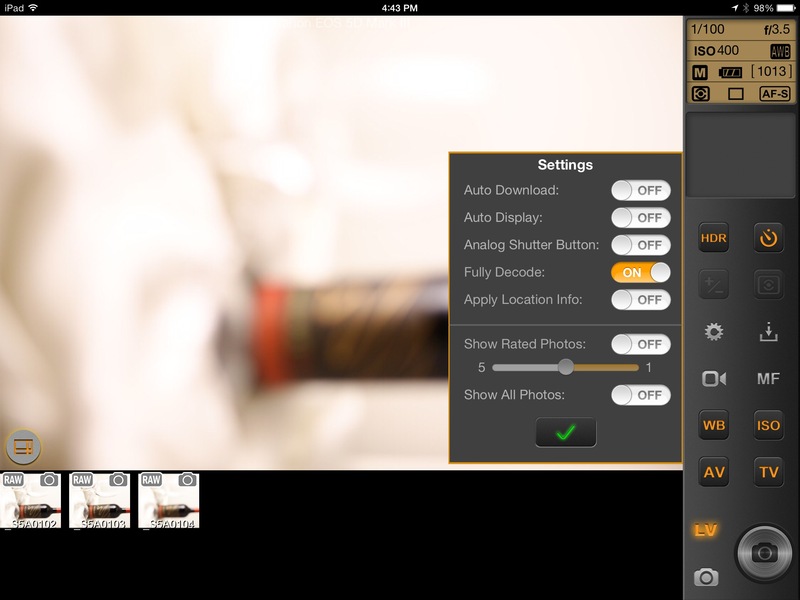 Using the control panel you can set ISO, Aperture, white Balance, etc. Each of these can be changed remotely using the iOS device. Tap on the orange text buttons to open a window where you can modify the setting. Tap on the green check button to commit the setting in the camera. See the image below. 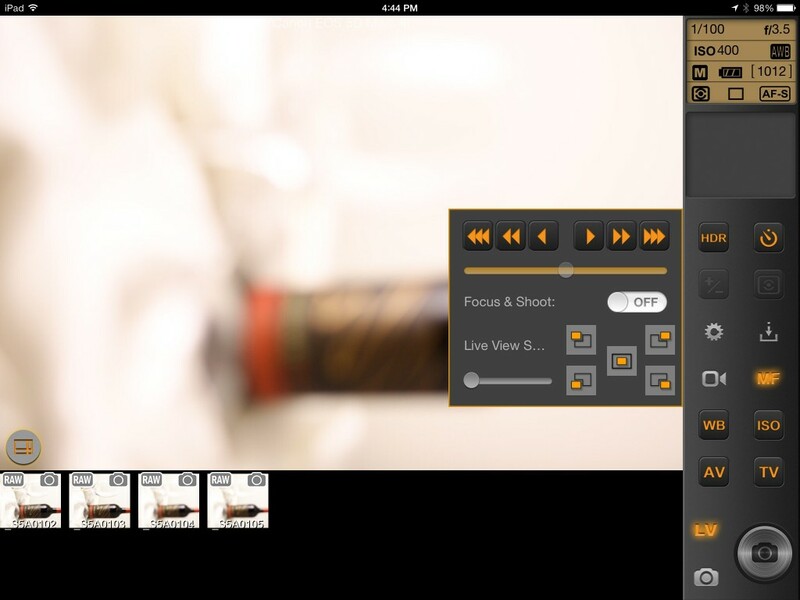 In live view mode, you are also able to select the point of focus by tapping on the area on screen to establish that as the focus point. If focus is established the focus indicator will turn green. If focus can not be established the indicator will turn red. Taping the “Camera Icon” you can remotely release the shutter. The shutter will be triggered only if there is a card in the camera with available space to store captured images and the camera attains focus. The image will be captured on the camera’s memory card and also transferred to the iOS device. These functions are based on the “Settings” panel shown below. You can also manual focus by tapping the MF button. A manual focus panel will open. Three sets of arrows will move the focus in either direction in small, medium and large increments. 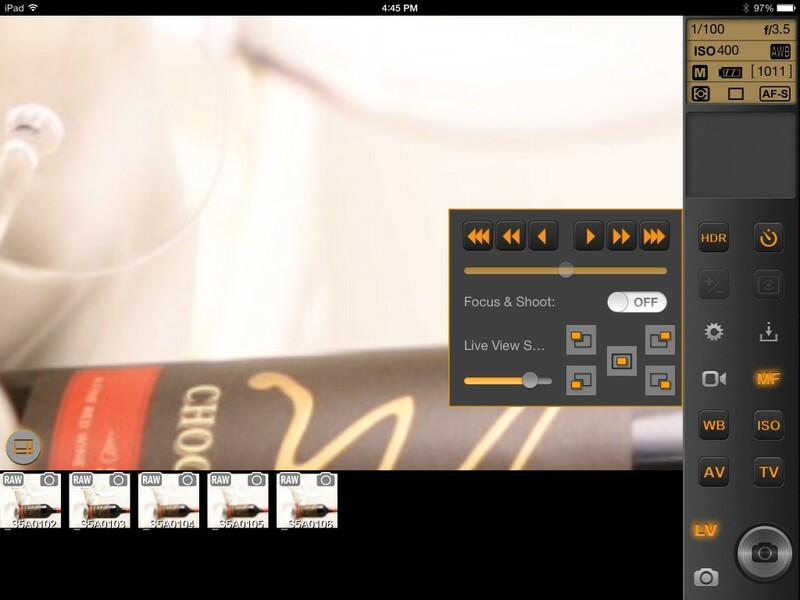 Five regions are available to review various areas of the live view screen. A slider is provided to increase the magnification for fine tuning focus. See the next image. Various functions are made available or greyed out base on Still or Video capture. If you click on the video icon the unit will switch the camera to video more. The shutter release button will change from a camera to a red dot. See below. Taping the button will start the video recording. While the video recording is in progress the red button will become brighter with a red indicator on the button’s circumference. A red flashing indicator will also display on the preview screen. 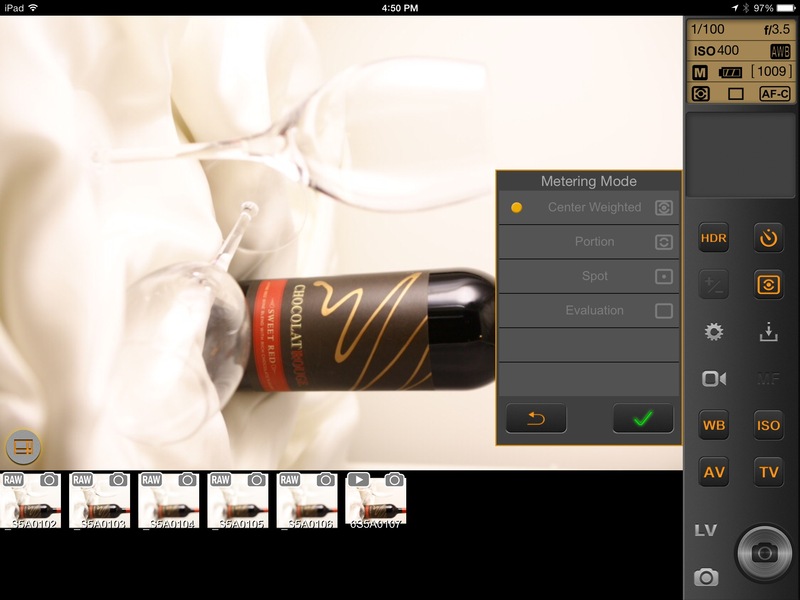 The iUSBport Camera and the iOS app also provide HDR and Timelapse functionality. HDR images can be captured in either Aperture priority mode (I do not recommend this method at all), Shutter priority mode and ISO mode where each can be bracketed in various increments and numbers of images captured. To capture HDR you must use the “Run” button not the shutter release button. 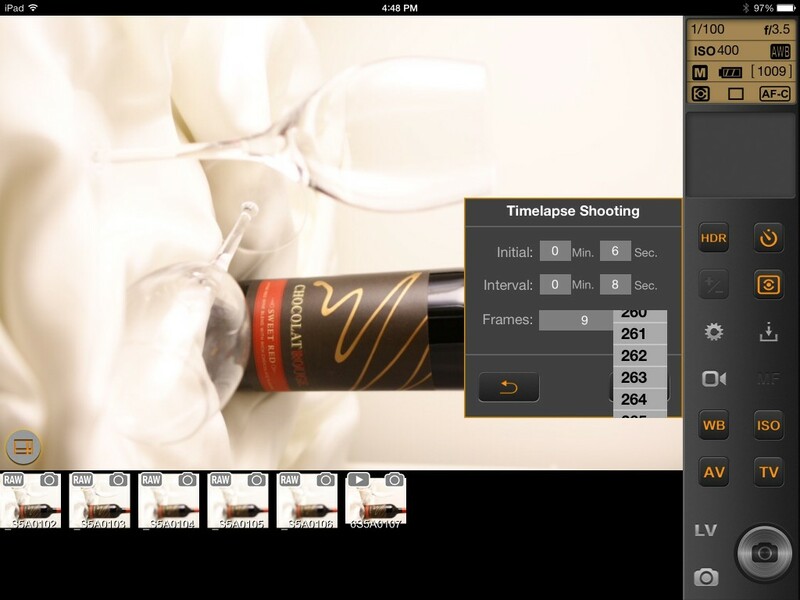 Time lapse sequences are captured by using the time-lapse button to the right of the HDR button. Set all required ISO, aperture and shutter setting in the camera settings panel. Next tap the Time-lapse button and set the initial start delay, the interval between shots and the number of images to be captured. Start the capture by tapping the “Run” button. A screen toggle icon is available on the left lower third of the screen. Tapping this toggles to a semi full screen mode. Tapping the camera icon (lower right corner) opens a settings window where you can make changes to your camera settings for exposure, white balance, etc. The top right corner has a icon that can be used to toggle live view on or off. The right edge center is the shutter release button. On the left edge toward the center is a filmstrip view that shows images captured. You can scroll up and down to select any image for display. See the image below. If you select an image from the film strip it will open full screen. A set of three additional icons will be displayed in the bottom edge of the screen. from left to right, the trash can, the histogram and a star ratings icon. The histogram and the other to set ratings icon open individual windows to display a histogram and a 1 to 5 star rating panel. 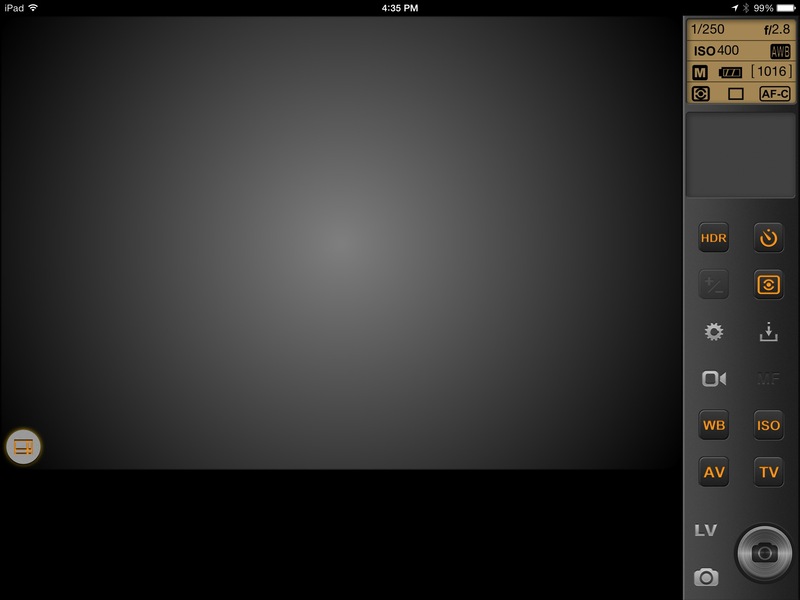 The histogram will only be displayed if the center icon (the histogram icon) is tapped. When this screen is active and live view is active the app will not permit any incremental zooming. 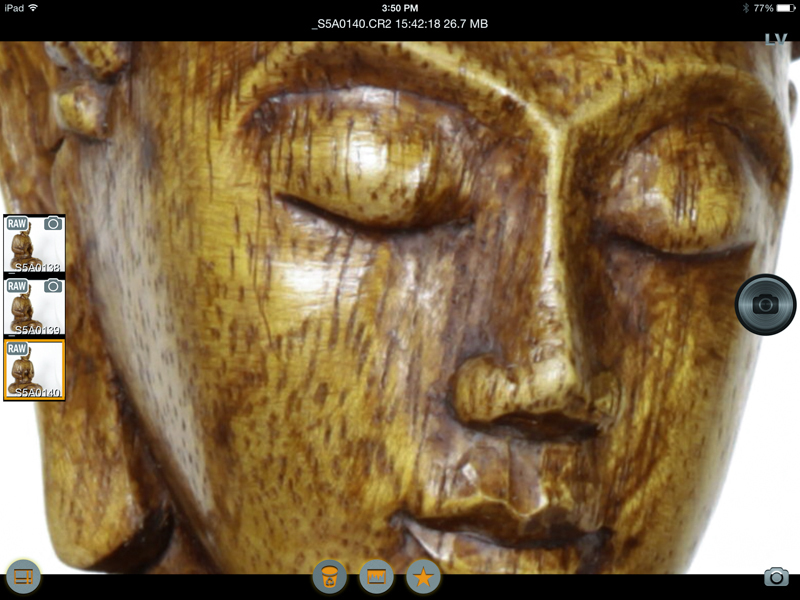 However zooming in is available when reviewing any images from the filmstrip. 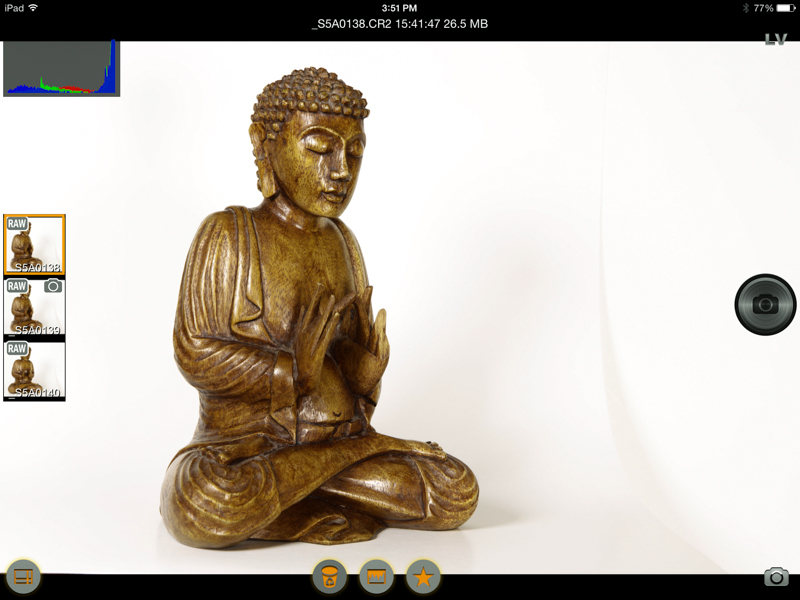 When an image is selected for review the top of the screen displays the file name, time of capture and the image file size. Establishing an ad-hoc connection with the iPAD was very easy and all the functions on the primary screen work as they should. 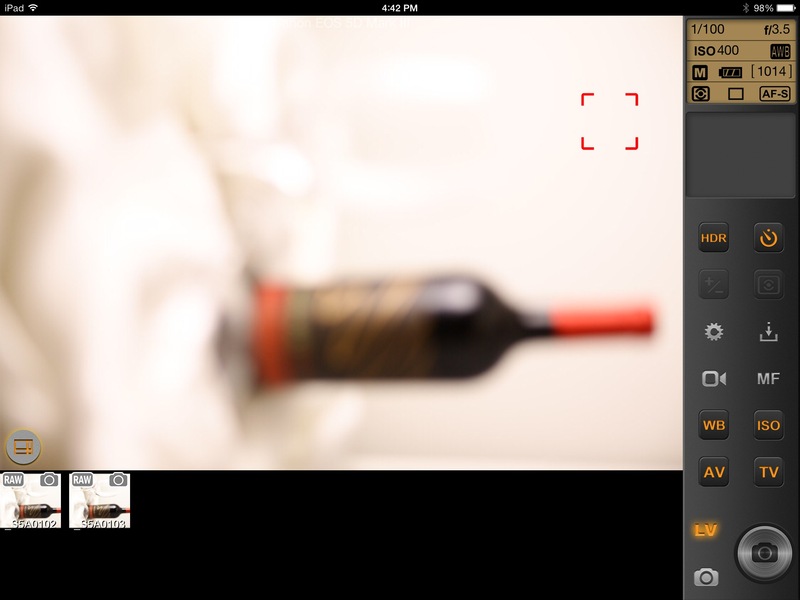 The preview and Live modes remain in the Landscape display mode irrespective of how you camera is oriented. This could be resolved and would make the application much more valuable. Camera functions were easy to change and registered as they should. The HDR mode is a bit clumsy and requires a little getting used to. 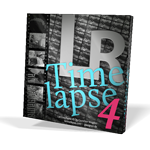 The time-lapse function is more than adequate for normal time-lapse capture. In the full screen mode all functions work as expected with one exception. I was unable to set any star rating. Each time the application would crash and required a restart. This problem exists in both screen modes and is an annoyance that need to be addressed. The other significant issue is during capture. As you capture images the filmstrip will show the first three images captured but none of the incremental images. You must scroll through to get to the current image. This filmstrip needs to advance as each image is captured. On the physical aspects the unit is fairly large and since it is designed to be mounted on the hot shoe of the camera the hot shoe foot is very loose. A clamping lever or a scream wheel as provided on most hot shoe flash heads would have been a good feature. At its current price point of $199 I would recommend this product for anybody wishing to remotely control their DSLR using an iOS device in a wireless network environment. My latest article has been published in Digital Photography School. Non DPS subscribers may read it using the link below. There are lots of excellent articles and product reviews available in DPS and they are all free. 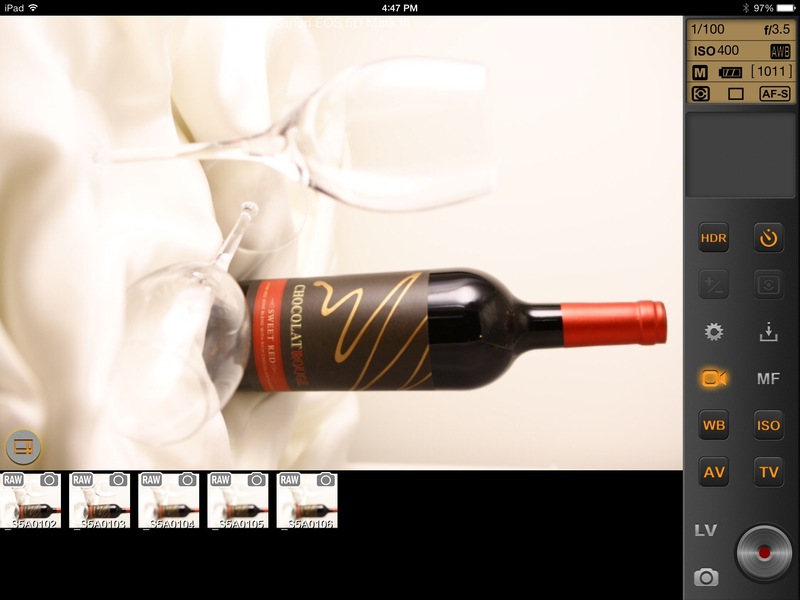 A post on DPReview http://www.dpreview.com/news/2014/01/18/adobe-leaks-lightroom-mobile-app indicate the mobile version of Lightroom will be released soon. The price point is what I find bothersome. An annual subscription of $99 or about $9 a month after adding taxes. Not sure if a non-cloud based License will be available or will the cloud subscription be the only option. Mobile apps range from $0.99 to under $50.00 and most are upgraded at no additional charge. Adobe appears to have its sights on a different pricing model. Think Tank Photo just announced a limited special offer. Between now and February 6, 2014, when you purchase a Retrospective® Laptop Case or a Retrospective® Camera/Laptop Bag you will receive for free your choice of a PowerHouse Air or a PowerHouse Pro clear organizer. The Retrospectives combine classic design with room for modern camera gear to create the perfect shooter’s bag. These lightweight shoulder bags come in three fabrics that offer a sense a style that matches your shooting needs. Click on the banner below to order.